In this day and age, we are truly blessed as far as the electronics hobby is concerned. Advanced modules such as gyros and motor controllers are readily available, not just as individual parts, but as pre-soldered modules that can be wired together with a minimum of fuss and at low cost. This simple balancing robot is a great example of what can be done with such parts (Google Translate link). The robot has an ESP32 running the show, which provides both the processing power required, as well as the WiFi interface used to control the ‘bot from a smartphone. 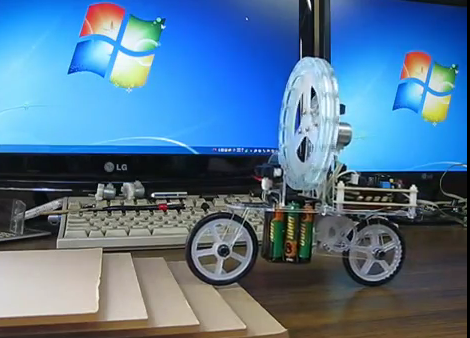 This is achieved using an app from JJRobots, an open-source robotics teaching resource. Stepper motors are controlled by DRV8825 modules sourced from amazon, and an MPU6050 gyro rounds out the major components. Naturally, source code is available on GitHub for your reading pleasure. It’s remarkable that in this day and age, it’s possible to build such a project with little to no soldering required at all. With a credit card and a healthy supply of patch leads, it’s possible to whip up complex digital projects quite quickly. We’ve seen a similar approach before, too. Video after the break. [Jochen Alt]’s Paul is one of the coolest robots of its type, and maybe one of the coolest robots period. Personality? Check. Omniwheels? Check. Gratuitous feats of derring-do? Check. Paul is a ball balancing robot. Under the hood, Paul isn’t all that strange. He’s got two microcontrollers, one for taking care of the balancing and kinematics, and another that handles the LEDs, speech processor, loudspeaker, remote-control, and other frilly bits. But the mathematics! Paul is a cylinder standing up on top of a bowling ball, so the only way it can roll forwards is to lean forwards. But of course, it can’t lean too much, because it has also got to balance. It’s absolutely the least reasonable means of locomotion. We love it. [Jochen] was nice enough to put everything up on GitHub, so you can see how it was done, even though it looks like magic. And we dare you to watch the video, embedded below, and not feel at least a pang of sympathy pain when (spoiler alert!) he falls flat on his face. Does he recover? We’d love to know! Paul is just one of the stellar robots in the 2017 Hackaday Sci-Fi contest, so head on over there if you still don’t have your fill. The inverted pendulum is a pretty classic dynamics problem and reaction wheels are cool. That’s why we like [Mike Rouleau]’s self-balancing stick. The video, viewable after the break, was fairly sparse on details, but he furnished some in the comments. The little black box on the top is a GY-521 Gyroscope module. It sends its data to an Arduino attached to the black cord which trails off the screen. The Arduino does its mathemagic and then uses a motor controller to drive the reaction wheels at the correct speeds. Looking at this legged robot gives us the same feeling we had the first time we saw a two-wheeled balancer. At first glance it just shouldn’t work, but after a little thought it makes a lot of sense. The six-legged bot called OutRunner uses two sets of three legs to propel itself. The footfalls are staggered to mimic how a biped runs, but mechanically it’s just spinning wheels to which the legs attach. If you have a smart enough algorithm it will not only remain upright but be steerable too. From the looks of the latest update [James] has made quite a bit of progress on his bipedal robot. He added to the top of the post just a few days ago, but didn’t include the video link which you’ll find embedded after the break. There’s about ten minutes of explanation before he gets down to demonstrating the static and dynamic balance which can be chosen using the buttons on a TV remote. We looked in on the project about one year ago. The most notable change is the control electronics anchored in the torso of the robot. At first it makes us a bit nervous that he hasn’t built a protective cage around the components. But after seeing the latest stability demonstration we guess it’s because this thing is fantastic at staying upright. The torso is connected at the hips in such a way that no matter where each leg is it will always remain upright. All together the thing stands twenty-six inches tall, but that will grow when he gets around to building a head for it. This robot is able walk the tightrope (translated). Well, it’s more of a shuffle than a walk, but still a lot better than we could do. In the video after the break you can see the bot starting on the platform to the right. As it steps out onto the wire (which rides in a groove on the bottom of its foot) the robot spreads its arms to help maintain balance. When the other foot leaves the platform that is the last stride we will see until it reaches the other side. The rest of the act consists of sliding the feet a little bit at a time until it gets all the way across. [Dr. Guero] has been working on at least one other balancer as well. Also embedded after the break is a robot riding a bicycle. It actually puts a foot down when stopped, and gives a stuttering push-off to get going again. This guy would be right at home riding past you in the hallways of the Death Star. This self balancing robot still uses just two wheels, but it’s balancing very differently than we’re used to seeing. Where most of the projects use a form factor that’s similar to a Segway, this works just like a bicycle. But it doesn’t need to keep the front and rear wheels spinning to stay upright. In fact, the video after the break shows it balancing perfectly while at a complete standstill. [Aoki2001’s] creation isn’t stuck in one place. He included distance sensors on the front and back which are used to move the bike as if by repulsion. The large wheel where the rider would be is what makes sure the vehicle doesn’t topple over. It acts as an inverted pendulum, pushing against the large wheel’s inertia by rotating the motor to which it is attached. The same concept was seen back in march on a full-sized bike. But why use two wheels when you only need one? His unicycle version can also be seen embedded after the break. It’s worth looking at [Aoki’s] other YouTube offerings too. He’s got a small robot which balances on top of a ball. It’s the desk-sized version of this hack.